Now, let’s move to Tissiyeh. This Creamy Chickpea and Yogurt Casserole might be the cousin to hummus. Like hummus, it includes chickpeas, garlic, lemon, tahini and salt. And yet, it goes so much farther. The toasted pine nuts and oil give the complexity characteristic of pignolas. 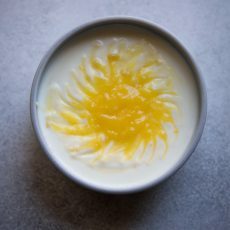 The bright and creamy yogurt is a bit of a revelation and yet if you consider how much yogurt makes its way into Mediterranean cuisine, it’s not an altogether surprise. Oh, hummus lovers, you are in for a real treat. We modified the recipe ever so slightly to make it compliant with how we eat in our home. In place of the flatbreads recommended in the Creamy Chickpea and Yogurt Casserole recipe, we heated up some gluten-free pizza crusts. I figured this substitution would still achieve the same textural goals of the original. This dish came together in such a short time and found it to be quite filling. 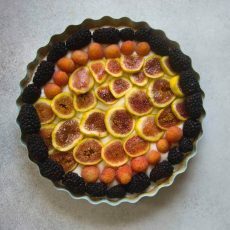 Gorsky describes Tissiyeh as a traditional dish served in Damascus, Syria, where her family lives. So when you’re in the mood for a light dinner, an interesting appetizer or comfort food in a bowl, whip up your own batch of Creamy Chickpea and Yogurt Casserole and leave the hummus for tomorrow. 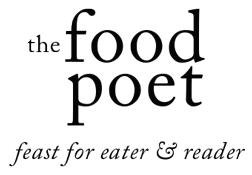 by Faith Gorsky from “An Edible Mosaic”. Preheat oven to 250. Put the flatbread directly onto the oven rack and bake until brittle but not burned, about 15 minutes, flipping once. Cool the bread completely, and then break into bite-sized pieces. Line the bottom of 1 large serving bowl (or 4 individual bowls) with the bread and set aside. Pour the chickpeas (and their liquid), water, and 1 teaspoon of cumin into a medium saucepan; bring to a simmer over medium heat. Ladle a bit (about 1 – 1 1/2 cups) of the chickpea cooking liquid onto the dried bread to make it moist, but not soggy, pressing down with a spoon to help the bread absorb the liquid. If you add too much liquid, just drain off any excess. Remove 4 tablespoons of chickpeas to a small bowl and set aside, and spoon the remainder of the chickpeas onto the moistened bread. Whisk together the yogurt, tahini, lemon juice, garlic, salt, 1/2 cup chickpea cooking liquid, and the remaining 1 teaspoon of cumin in a medium bowl. 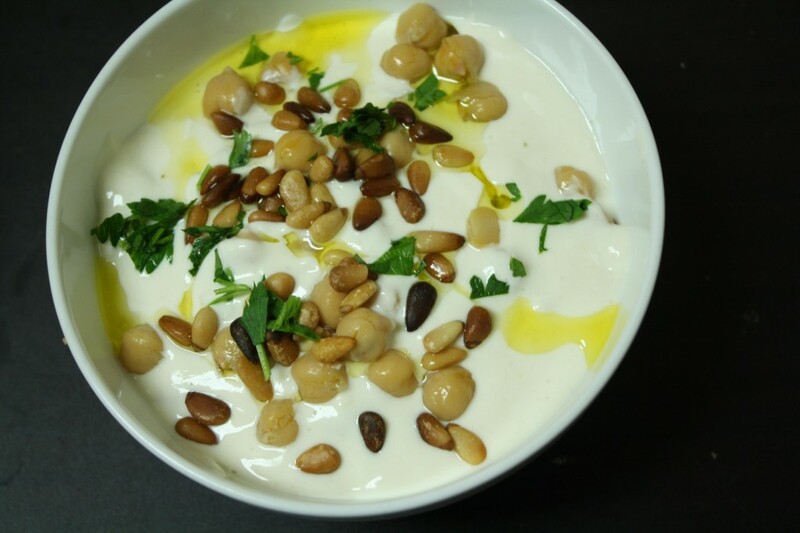 Pour the yogurt mixture into the chickpeas and sprinkle the remaining 4 tablespoons of chickpeas on top. Heat the oil in a small skillet over medium heat; add the pine nuts and cook until golden brown, about 1-2 minutes, stirring constantly; set aside. 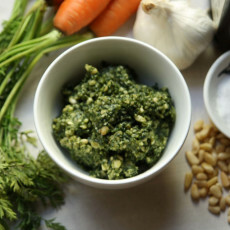 Drizzle the pine nuts and their oil on top, and sprinkle on the parsley, if using. Serve immediately.